While our favorite time of the year is rafting season, there are so many rad Colorado mountain towns to explore in the winter, especially if you want to Ski or Snowboard. From larger sprawling towns to smaller quaint towns, there is a perfect place for every trip! 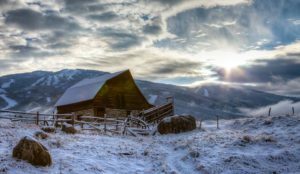 Here is a list of our top five Colorado mountain towns to visit and Ski or Snowboard at in the Winter! 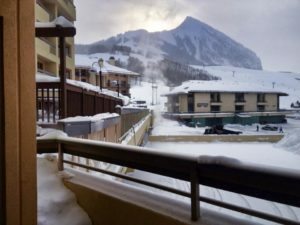 Also known as Ski Town USA® Steamboat is located in North Colorado’s Yampa Valley, this Colorado town is home to two ski resorts and geothermal hot springs. Known for Champagne Powder® and the home to many Olympians Steamboat is the place I choose to spend my winters. Howelsen Hill ski area is the oldest ski area in continuous use in Colorado and has operated since 1915. This small resort has 50 skiable acres, and houses the largest natural ski jump in the North America. It has also been a training area for many Olympians in its’ days. Steamboat Resort is larger with 18 lifts, 165 trails and 2,965 acres of terrain. This resort offers terrain for all abilities, however 42 percent of terrain is intermediate and 44 percent advanced. This Colorado resort is also known for its Champagne Powder® snow to the locals and avid skiers alike. Along with extensive mountain terrain, this little mountain town also hot springs! Who doesn’t like a good soak in the winter after a long day on the mountain? Relax at Strawberry Park Natural Hot Springs (http://strawberryhotsprings.com/) for an evening soak! Or stay in town at Old Town Hot Springs (http://www.oldtownhotsprings.org/) We cannot think of better way to start or end a day in Colorado. Among these reasons to visit, you will also find friendly locals, shops, dining, community events and abundant nightlife choices. Visit https://www.steamboatchamber.com/ to learn more about the town and other winter activities, and www.steamboat.com or http://steamboatsprings.net/index.aspx?NID=131 to learn more about the resort. This town started out with a silver mining boom, leaving historical landmarks, such as The Wheeler Opera House, behind for locals and visitors alike to admire. This town is a year-round destination for outdoor recreation, but when it comes to skiing you have a lot of choices, 4 mountains worth. Aspen Snowmass Ski Resort includes four mountains in and surrounding Aspen, Colorado town. Aspen Mountain. This mountain includes 675 acres and 76 trails. The terrain here is 48 percent “more difficult” and 26 percent “most difficult” and expert, excluding all “easiest” terrain. Aspen Highlands. This is the most aggressive of the mountains, with 65 percent being rated at an “expert” difficultly level. Ski the 1,040 acres of terrain and explore one of the 144 trails. Buttermilk mountain. The 2018 Winter X-Games were hosted here. This mountain offers 470 acres of terrain with 44 trails. This mountain is more beginner friendly with 35 percent being rated “easiest” and 39 percent “more difficult” terrain. This mountain has 5 percent “expert” terrain. This mountain has the most vertical rise with 4,406 feet. It has 3,332 acres, 96 trails, and award winning parks and pipes with over 80 features. Snowmass has just 5 percent “easiest”, 48 percent “more difficult”, 17 percent “most difficult” and 30% “expert” terrain. Take your pick, or go to them all, but you will have plenty of acres to explore if you visit this town. 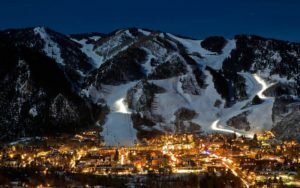 Along with outdoor adventure, Aspen is known for its high-end restaurants and boutiques. If you make it out, enjoy the luxuries that this mountain town offers. This mountain town was established in 1859, and while it is now bustling community, you can still feel that old mountain town charm. Breckenridge is located on the Rocky Mountain slope in Colorado, most well-known in the winter for its’ ski resort. With nearly 3000 Acres of skiable terrain, 34 lifts, and 187 trails it is no surprise that beginners and experts alike find this Colorado town to be the perfect destination. Come for a week or longer and we’re sure that you’ll find plenty of trails to keep you busy. From art, dining, boutiques, sports, breweries and concerts – the entertainment possibilities here are endless! 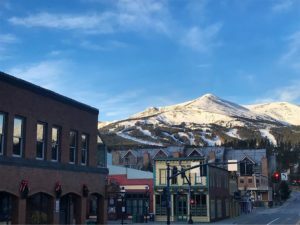 Visit www.visitbreck.com to learn more about the town and other winter activities and https://www.breckenridge.com to learn more about the mountain. Looking for old western charm? Crested Butte has done an awesome job at restoring its historical look and feel and keeping that “mountain town” vibe alive. This Colorado town also has plenty of fine dining, lodging and recreation to compete with the rest! The Resort itself is known for some of Colorado’s most epic terrain. Within the 1,547 acres of terrain you will find 121 trails featuring beginner, intermediate and advanced runs. The Extreme Limit, as they call it, offers 542 acres of inbound double black diamond terrain. It is no wonder that the national extreme skiing and snowboarding championships are held here! As the city’s website will tell you, this is a “real skiers town” or “the last great Colorado ski town”. If you’re not a skier, there are still plenty of ways to enjoy the winter here! Visit http://visitcrestedbutte.com to learn more about the town and other winter activities and http://www.skicb.com to learn more about the mountain. Vail is a legendary resort that was founded in 1962. Vail is a mountain resort community that was incorporated shortly after the ski resort in 1966. It prides itself on giving its locals and guests alike a world-renowned resort and small town feel. 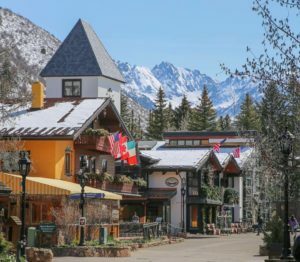 Sitting at 8,150 feet, Vail offers amazing mountain views, skiing terrain, luxury accommodation, and a variety of shops and restaurants. This town has also become home to the Burton US Open Snowboard Championship, March 5th through the 10th in 2018. Vail Ski Resort is massive and has 5,289 Acres of skiable terrain. One of the biggest in the world. The terrain is widely variant, giving everyone a lot of to terrain to explore. Be it groomers, tree runs, bumps or steeps, Vail has it all. For the Avid skiing types, find your way to the resorts back bowls or Blue Sky Basin for more back country and advanced level terrain. If you are planning a trip to Vail, stay for a while. It can take a while to see the whole mountain and town, and you probably will want to. We have given you 5 Colorado mountain towns and ski Resorts to explore on your next trip. The truth is, when you come to Colorado, you can’t really choose wrong. Maybe you will even get to see our infamous Blue Bird Powder day! We live, work and play in these mountain towns during the winter and hope that wherever you go, whichever you choose, you have an awesome adventurous trip to remember!